Drink from a full-fledged water bottle but collapse it down to half its size to transport. 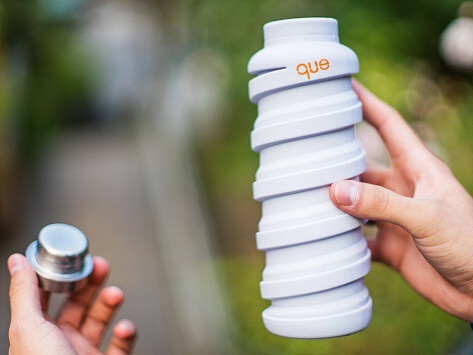 que’s flexible silicone has spiraled grooves that collapse and expand like an accordion. Its stainless steel rim and cap keep an air-tight seal that prevents leakage. Slip it into a backpack or purse and hydrate anywhere. Liquid capacity: 12 or 20 fl. oz. Tried it out on a cross country trip - it is great! So far she likes it. She takes it to the dog park. Likes the size. Great replacement for plastic bottles. Handsome looking and easy to use and store. Glad I found this! This BPA-free water bottle collapses to take up hardly any space in your backpack, purse, or even fanny pack. The spiraled groove running around que allows the bottle to expand and contract like an accordion. Its dishwasher-friendly, flexible silicone body has a steel drinking rim and cap which creates an air-tight seal and prevents leakage. Married duo Jean Wu and Kevin Shen wanted to dissuade people from using disposable plastic bottles. 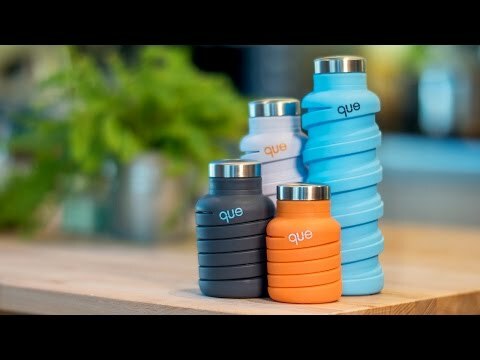 que’s clever convenience makes helping the environment easy!